Like many other Americans, I’ve been planning my Thanksgiving menu this week. Let’s be honest, Thanksgiving is a HEAVY holiday. I love Thanksgiving food, but I’m not a fan of that heavy, sick-to-your-stomach feeling that comes from eating too much. I was shocked to learn that the average Thanksgiving dinner is around 3,000 calories. Really! And that doesn’t include breakfast or lunch—we’re talking just the holiday meal itself! Holy moly. Over the past few years, I’ve worked to lighten up my Thanksgiving menu without sacrificing on flavor. My husband’s maternal family is Sephardic Jewish from Israel, which means we’ve been gifted with some fabulous, healthy family recipes from the Middle East and Mediterranean. When Thanksgiving rolls around, I like to add some of these dishes to the mix to lighten things up. To be fair, some holiday foods are best made without worrying about the fat– like desserts, for example. But lightening up just a few side dishes can put a big dent into the turkey day calorie count. Take green beans, for example. A typical Thanksgiving side dish is Green Bean Casserole. Green beans swim in butter and cream sauce, then they’re topped with deep-fried onions and baked into a casserole. Whoa. Heavy with a capital H! 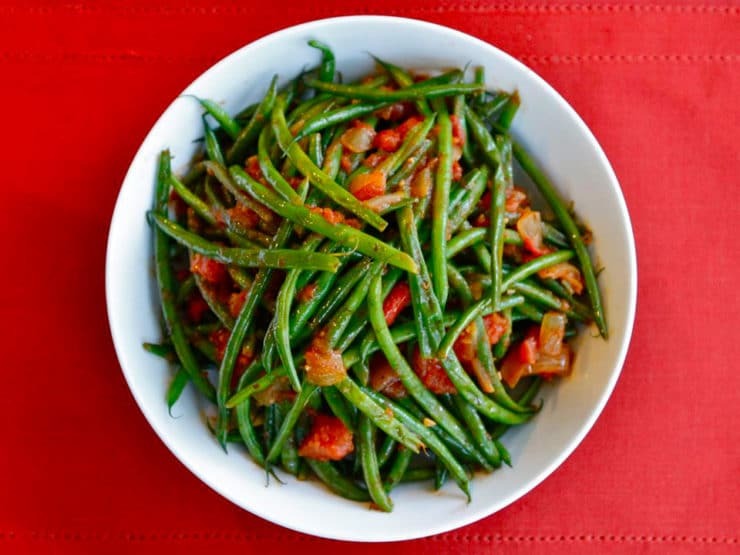 Why not consider swapping this caloric side dish for something lighter, and in my opinion even more flavorful, like our family recipe for Green Bean Tomato Sauté? 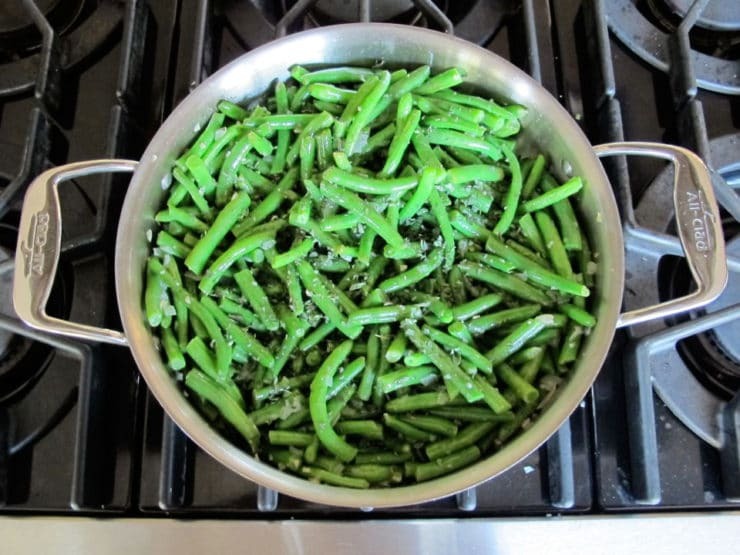 This green bean dish is super simple to make and really, really tasty. It’s also a great recipe to make ahead, which can cut down on your holiday prep time; the green beans taste even better after marinating overnight in the fridge. 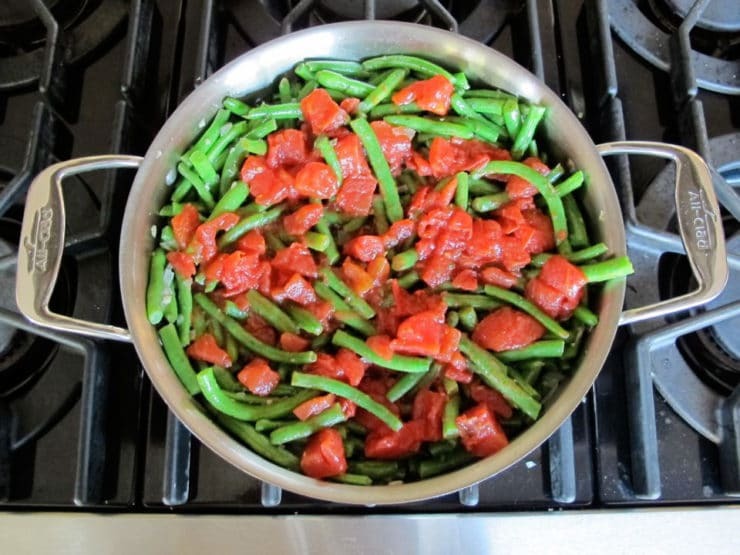 Recipe for Green Bean Tomato Sauté - a healthy, flavorful, gluten free, vegan side dish. 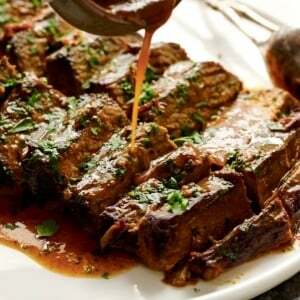 Can also be made as a meatless entree. Easy and yummy! If using young small green beans, you can keep them whole without trimming if you like. 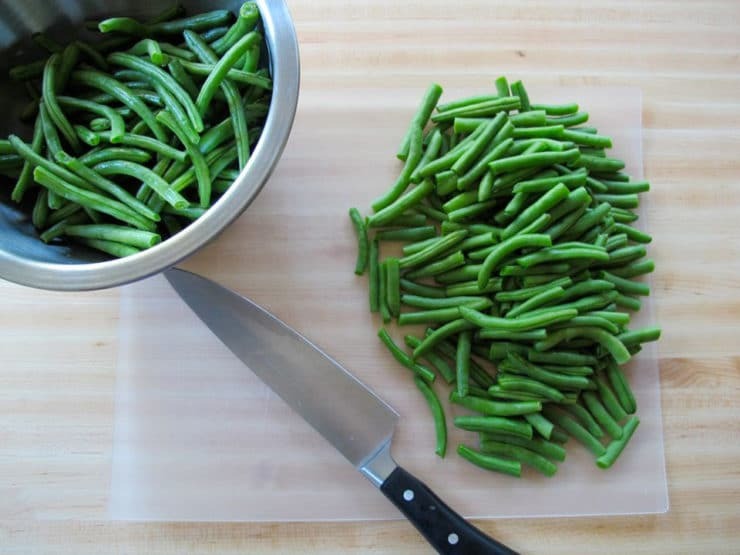 For larger green beans, chop them into 1 1/2 - 2 inch pieces. 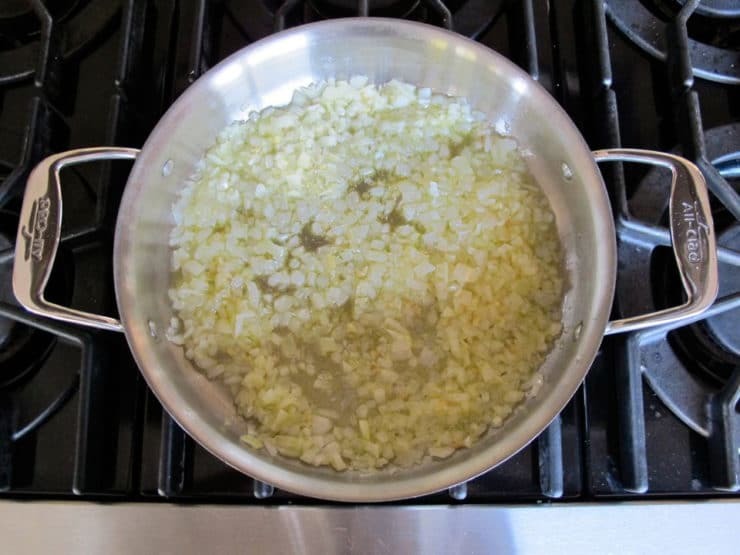 Heat the oil in a wide sauté pan over medium. Sauté the diced onions for 5 minutes till softened. Add the minced garlic and continue to sauté for another 2 minutes till fragrant. Add the green beans to the pan and sauté for 2 minutes, stirring occasionally. Add the tomatoes, tomato paste, and oregano to the pan. Stir till all ingredients are blended. Add hot water to the pan till the green beans are about 80% covered. Add sugar to the pan, and season with salt and pepper to taste. I usually add about 1 1/4 tsp of salt and 1/2 tsp of pepper. Stir all ingredients and bring to a slow boil for 2 minutes. Cover the pan and reduce heat to low. 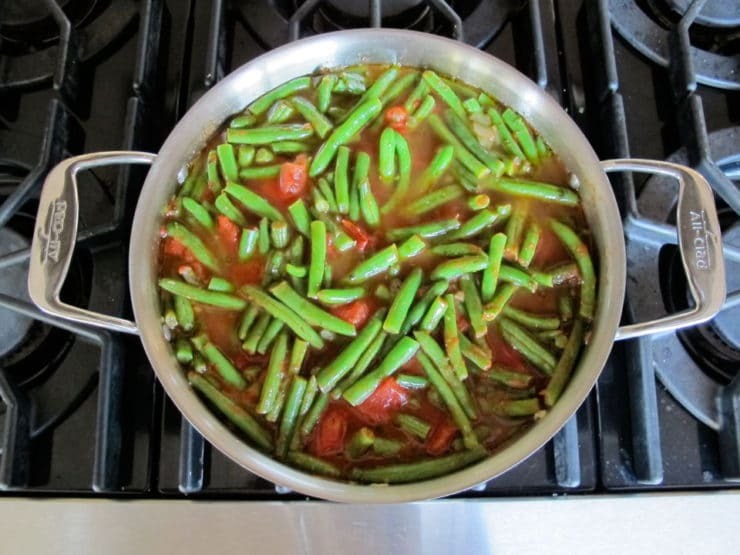 Let the green beans cook for 10-50 minutes, depending on how soft you like the green beans. If using small young beans, you will only need about 10-15 minutes of cooking to make them tender, then uncover the pot and let the sauce simmer and reduce a bit before serving. For larger beans, 20 minutes will produce a tender-crisp "al dente" texture; 50 minutes will make them very soft. I like to cook them for about 30 minutes, so they're tender but not mushy. Serve the green beans warm as a side dish, or at room temperature (which can be nice during the summer months). The tomato sauce is perfect for dipping fresh bread. It's the kind of dish that improves with time, so if you want to cook the green beans a day ahead and let them marinate overnight in the fridge, they will taste even better the next day! How many servings is in your vegan green bean recipe? This should make about 6 servings. I have tried similar recipes, but this one is far superior, as the delicious flavors are nicely incorporated into the beans. I’m looking forward to trying more of your vegetarian recipes. I tried it and it was very good. Thanks. So glad I found your recipe – delicious! Everyone in my family wants this dish on a regular basis. I didn’t add the sugar. If I make this a day ahead, would you suggest reheating, or service at room temperature? Thanks! Hi Monica, I happen to think this dish is great served hot or at room temp, but I think I prefer it warm during colder seasons. Hi Leon, apologies but I don’t currently offer nutritional information on my recipes. I have been making a simplified version of this for years. I cut the beans, chunky cut some whole tomatoes, and add both to a hot saute pan along with a cup or two of water. Once the tomatoes start break down I will often add sliced mushrooms. Simmer til the sauce thickens. Season with salt and pepper and eat! Thinly sliced onion is a good addition. 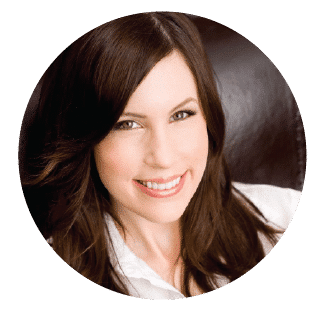 Hi Tori, I am new to your blog and I like the way you write a story connected with each of your dishes. The only doubt I have about this recipe is regarding the nutritional value of the vegetable if it’s cooked for 30 mints or more as you say. I always thought any vegetable other than root vegetables cooked more than 10 mints loses its color thus losing its vitamins . Hi Roshini, the traditional way to cook this dish is to cook them low and slow. Larger beans take a long time to get tender, they can be quite tough. 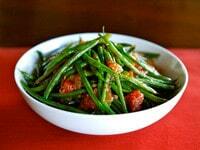 If you’d like to shorten the cooking time, use very small young green beans (the dainty french variety- haricot vert). 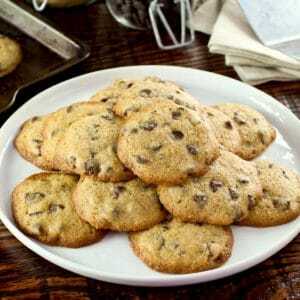 They should soften in 10-15 minutes, or less if you prefer them tender-crisp. Enjoy! Roshini – No worries about losing nutrients…the water soluable vitamins will leach into the juices, which you are going to consume, just like if you were making soup! Instead of getting frustrated at the dinner, I decided to clog their arteries with the usual, Southern casserole and kept this for myself! We go to a potluck Thanksgiving, which is nice in terms of prep, but bad in terms of calories and variety. I now am I charge of appetizers, so I can at least get a good crudités in the mix. This looks awesome! Healthy and tasty. Right up my alley. 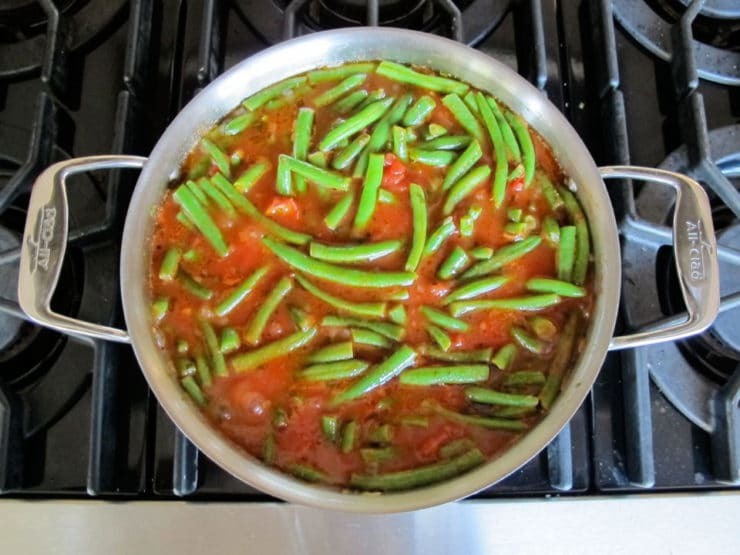 Tori – green beans with tomatoes is one of my all time favorites! I make mine slightly different – but I have to say….I think I like yours better! Thank you SO much for sharing this one! It’s a winner! I use a similar recipe via my friend’s Turkish MIL’s recipe. many times. I have also used frozen cut green beans in a pinch, and that’s quite good too. Fresh beans are better – but the frozen will do. Torí, thank you for the help that you are giving me with this vegan recipes. One more for my thanksgiven dinner.